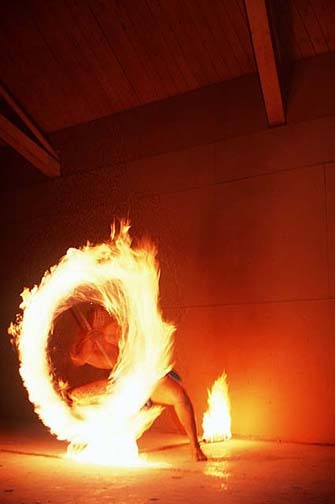 Staff spinning has long been an art form in many cultures, such as Polynesian Fire dances. Also known as deeblesticks, a great deal of the techniques evolved from martial art forms such as bo and jo stick, eskrima and aikido. See also the Club Swinging page for information on Whip chains, which are 7 or 9 sectional staffs. A Western variation upon the theme is cane manipulation, a skill most commonly associated with W.C. Fields, or Fred Astaire. Back to Juggling Index Page. The first question you need to answer is whether you intend on using two shorter staffs, or one long staff. You want to be able to do all the tricks in either hand, and you will start out with only one staff whether you go for two or not, so don't make a selection based on lack of dexterity in one hand. The main differences are a matter of how they look to an audience, and the speed. A longer staff spins a lot slower due to its length and weight, but the wide diameter of its spin more than make up for this. Two short staffs look more complex, but almost seem less 'dangerous' due to the longer staffs constant intertwining around your body. Short staffs do however bring the flame a lot closer to your body, making burns are more ready danger. If you like one, you will probably take up both eventually, so don't worry about which one to go for first. It is of course also possible to spin two long staffs at once, and you gain a visual aspect, whilst losing a few of the tricks from each of single long staff, and dual short staffs. Also see Purchasing details below for buying a ready made fire staff. A Long staff will probably be between 4 and 6 feet long. This gives the widest diameter of spin without constant danger of the staff hitting the ground. Two short staffs will probably be between 30 and 50 inches long. I base my selection on personal arm length. If gripping the center of the staff, I want the end to reach the middle of my upper-arm. For reference, I am 6 feet tall, and my short staffs are 38 inches long. As for diameter of staff, that is a personal choice, and can range from pen thickness up to whatever you can comfortably hold in your hand. The basic range in size would be somewhere between 0.5 and 2.25 inches, averaging at 1.25 inches. The traditional names for the various length staffs are: bo or rokushakubo staff (6 foot), jo staff (4 foot), hanbo (3 foot), tanjo or eskrima staff (2 foot). For material there are 3 main options: Bamboo, Wood, and Aluminum. Bamboo is purely to start off with, being very cheap. It can be dropped without damage to most flooring, and without concern for the staffs themselves. Due to its very light weight mis-throws when practicing inside are not as dangerous. However its lightness also makes the speed of spin a little more than that of a heavier material, making some tricks seem harder than they would otherwise be. The source that I used was a trinket store in the local Chinatown. Wood is a much heavier alternative and not really the best option unless you cant find bamboo, in which case it is nice and cheap and easy to learn with. Its weight helps it move slower aiding in learning. It is by no means bad, and is what I learnt with; however, it fails on every comparison with aluminum and should be a second choice. The above is rec.juggling advice. Personally, my favourite staffs are my single jo staff (4foot), and double hanbo staffs (3foot). The added weight helps build up muscles in al the right places, and makes it a more rigorous, and therefore for me, a more satisfying workout. Wooden doweling from a hardware store is great. A little thicker and more dangerous to personal safety (due to weight) are actual martial art staffs from a martial art supply store. Aluminum is the best material to use. It is light, smooth surfaced, will not splinter, dissipates heat well, will not burn, very strong, and is naturally shiny. The best source for aluminum tubing is a home supply store. Look for shower rods. Juggleart, in Melbourne, Australia, also sells fire staffs. They have a 4 different types of Fire staff, 2 of which are described on their website. Attach Glow sticks to each end for an indoor friendly, or blacklight, or just safer version of fire staffs. Glow sticks can be wrapped around (if using necklace glow sticks) or laid along side, and attached with electrical tape. Attach ribbons/crepe paper or flags to the staff for a daylight oriented show. If attaching ribbons, remember to make them point slightly inwards, along the circumference of the circle that the staff with create. Using ripstop nylon supposedly makes a good noise as it slashes through the air. Experiment with other materials for different sounds. You can also screw a club knob over the end of the staff. The knob holds down the ends of the ribbon and the ripstop tassle, as well as adding bounce and protecting one from injury. Wrap ribbons, sheets of fabric, or reflective foil around the entire length of the staff. Remember you need to keep the center 8 inches or so completely smooth so as not to interfere with the actual twirling. Reflective foil is available in a variety of patterns from Renegade Juggling. b) Put one layer of wicking against the staff and use 2 screws to drill this in tight. c) Wrap the remainder of the wicking as tight as possible and then even tighter (important because it preserves your wicking by letting less air through). d) This is the fiddliest bit of all. It helps to have a clamp to clamp the stick down and an extra pair of hands. Get your helper to hold the wicking tight. Drill two long screws into each end of the wicking and (if possible) also into the staff. It helps if you have drilled these holes earlier but there's a good chance you miss them anyway. Also, hold on tight because the wicking really bunches up around the drill. See the JIS page for info on changing the colour of the flames. A good cheap source for wicking if you don't want to order the purpose made stuff, is cotton belts from army surplus stores. It is more than possible (I'm not going to say its easy, some people can make anything difficult ;) to blow the flame out, but it only lasts on a full flame for a max of 5 minutes, so there shouldn't be a problem. See other sections of the Juggling Information Service for help with fuel, and safety. If you are using a wooden staff then you might want to attach some kind of sheet metal between the wood and the wicking in order to stop direct burns, however the heat will still char the wood through the metal. The majority of tricks can be done with both short or long staffs, and I'll leave you to figure out which ;) All tricks, unless otherwise specified, are started holding the staff at the center. The primary grip is holding the staff in the notch between the thumb and index finger. I found the best method to teach myself by, was to just experiment. I bought 3 foot, 4 foot, and 6 foot long lengths of bamboo, and stand in my garden/driveway twirling them around my body deciphering out what motions work, and what motions result in a whack to the head, or a tangle around a limb. See the OffJazz: Hat and Cane page for some incredible videos of specific finger movements of actual baton spins (not what I'm attempting to describe here). These moves are a little slower, but a lot more precise than what i talk about below. The videos also show moves that keep the staff in a single completely flat plane of motion. The main action is the "figure-eight": You want to start with the staff pointing straight up and down, 1.5 feet to the side and in front of your body. You start the top end (End A) rotating forward and down and slightly to the inside, so that the bottom end (End B) comes up just to the outside of your arm. Once the position has been rotated 180 degrees, with End A now at the bottom, and End B pointing up, it should be a simple matter to keep rotating End A back up the inside of the arm, and End B rotating pointing almost straight forwards. You have now reached the starting position of the staff again. However due to the inertial movement of the spin, you cannot rotate the staff in the same manner again, but must mirror the movements. End A will now spin forward to the outside of the arm, and End B will come up on the inside of the arm. (At this Point you can either keep the rotation going, or make the baton spin). Once a full spin has been made, you are back in the true starting position and can begin the cycle anew. This is a VERY complicated way of describing a very simple movement. As with any juggling, harder to put into words than to show. Another way of describing the movement, is that you are making a full circle with End A on the inside of the arm, and then making a full circle with End A on the outside of the arm. This is Identical to the Figure-Eight, except there is an extra half-rotation halfway through the last circle. In the Figure-Eight description, where it mentions the baton spin, instead of letting End A rotate back and up on the outside of your arm as usual, you will keep you hand palm facing up, and create a gap between your index and middle fingers, letting the center of the staff rotate over the index finger, and then rotating the hand with the staff. Once the staff reaches its original vertical position your hand will need to grip the staff completely. (staff still protruding between index and middle fingers, but thumb and other fingers all holding on also). End A will now be at the bottom, and End B at the top. You will need to slide the index finger out so that the staff is once again gripped between thumb and index finger only. Identical to the Baton spin, except after you rotate the staff between index and middle fingers, you continue the spin between your middle and third fingers, after this bringing it back to the original position. Theoretically a triple baton spin is possible, you would need a strong pinky to bring it off with certainty and speed though! The basic figure-eight can be done on a horizontal axis as well as the vertical axis. Try one staff spinning vertically and one horizontally, or both in unison. Try spinning the staffs with your arms stretched out at your sides, parallel with your body, looks like a helicopter blade attached to each of your hands. With long staffs, try them spinning with one on the front of your body, and the other at the back, letting them reach the switchover point together. Try holding the Staff/s at a point other than the center. Spin it on a completely flat horizontal, axis using some part of your body as a pivot only, not gripping any part of the staff. See the TwirlMania Baton Page on Rolls for Many more ideas. Throw a staff whilst its spinning straight up about 4 feet and catch it and continue the spin smoothly. This is easiest when the staff is spinning on a horizontal axis. In a vertical or horizontal plane. On the top end's inward spin, instead of letting it continue past your body, bring your hand in close and let the staff slap and come to a dead halt in your armpit. Improvise on various forward and backward spins to bring it back out again. Catch in center of staff on top of foot and throw back up. The two sticks literally crossing each other over. Start with sticks in an x shape held in front of your body, touching each other. Start twirling them outwards. (basically two vertical figure-eights but with the arcs intertwined with each other) You can get really fast at this and vary it, it's quite a nice trick. A really good variant of it is doing this x above your head, getting them going, throwing them up in the air (while they spin) and catching them and keeping going. Playing with two sticks in a 'x' shape in one hand and two in the other. You can do a lot of 'one stick' tricks holding two in one hand. You can also practice twirling the two around each other in one hand. Hold the staff about 5 inches from one end, with the longer end pointing forward and up at about a 45 degree angle. Let the front end drop downwards and to the outside of your arm, and 'whip' it hard, so it spins one complete revolution and back to its starting point. I think this is a sword flourish. You can do one revolution and stop, or keep it going alternating inside, outside, to gain a wider circumference spin than otherwise, this would be in essence a figure-eight just not holding the staff at the center. Lying down tricks - passing the stick under your legs, around your body. Standing up and passing the stick through your legs - pretty clumsy, doesn't look great. A number of moves can be extrapolated from exchanging the staff from hand to hand in mid spin. Behind the back: whilst doing a verticle figure-eight at one side (so the staff is spinning parallel with your body), bring the hand down and behind your back, so that the top end (when your palm is facing forward) is facing upwards when your hand is directly in the small of you back. At this time, exchange hands and spin it outwards into a verticle figure-eight on the other side of your body (you have to be able to do a figure-eight spin in both directions). 360 exchange: Do a standard behind the back exchange, except just as you change hands, very quicly spin your entire body 180degrees, and grab the staff with the first hand. keep rotating the body quickly, until you are back in your original position, with the staff doing a vertical figure-eight in the original hand. alternating exchange: with you feet facing in one direction, twist your torso, so that you are holding your arm out straight behind you. start a vertical figure-eight spin, and instead of bring it behind your back, reach around with your othe hand, and as you make the exchange, twist your whole torso around in the other direction. continously alternate this to complete the move. To make it seem more dramatic, exagerate the body motion. Basically the staff is staying spinning in one place, but you are spinning your whole body in almost a full circle every second whilst exchanging hands. Most variations involving the cane center around thematic elements, or the (if a part of it) curved handle of the cane. Aside from this, they can be treated in a similar fashion to staffs. Thematically, the cane can be used along with pocket handkerchiefs (juggling), hats (balances, rolls, juggling), cigars (manipulation, juggling), pool balls (contact juggling, standard juggling) gloves (juggling) and the monocle or pocket watch (manipulation, swinging). See the Hat manipulation page for more information on this. Also see the JIS: Tricks with Hats & Umbrellas page, for a lot more information on all these thematic objects. 1) To catch the stick using your appendages. 2) To twirl the stick about one of your appendages. I say appendages instead of arms, as ankles make good twirling pivots, and catching/throwing points. Canes can also be used for balancing any other object. Examples of canes being manipulated, along with other objects, can be seen in many old movies. See the JIS page on Juggling in Movies for more information, or see my edited list in the resources section. See also the JIS section on W.C. Fields. Quoted from Juggling - its history and greatest performers by Francisco Alvarez - Online at the JIS. "The 'gentleman juggler' was now firmly established and performers were elegantly dressed in formal evening attire. Tricks with hat, cane and gloves were popular. A cane would balance on the performer's forehead and a top hat was thrown to be caught on the top end of the cane. Now the cane was allowed to slide down the back so that the hat would fall on the head; and the cane, by some magic that only jugglers understand, became wedged between the hat and the performer's head, hanging out like a pigtail. To add humor to the skill, the performer would say he had learned the trick from the great Chinese juggler On Too Long. (NOTE - This routine and patter was actually done by the Australian Davey, but much later in the century.)" "I was at an Egytptian wedding in Orange County CA, and the entertainment included a men's cane dance. I got to talking to the chief dancer, and he said this was a hidden sword form dating from the Mameluke occupation of Egypt." i will try and hunt down more info on this later. For use of cane as a martial arts weapon, find information on the forms of Hapkido, Taijiquan, Bando, Taekwondo, Kuk sool, and Hwrang-do. See OffJazz: Hat and Cane page for some incredible videos of specific finger movements. The main resource for actual staff spinning on the internet is the rec.juggling newsgroup and its archives (kept at the Juggling Information Service). A Wonderful video clip can be found at Drums of Polynesia web site. 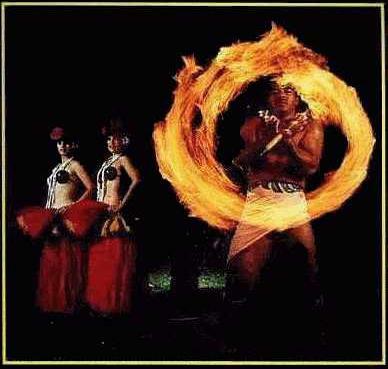 It is a Real Player streaming video clip, and at 8.25 minutes into it starts a great 1.5 minute segment showing a Polynesian fire dance with one, and then 3 people. "This book is a modern treatise on the old art of club swinging. Anna presents her experience as a performer and teacher in 20 clearly illustrated lessons. Beginner to advanced moves on snakes, fountains, warming up, and information on using fire, UV light, performing and pole swinging." 112 pp. 8.25 x 11.5. Paper. US$16.95 ea. Available from Dubé Juggling and Serious Juggling. Supposedly this book only has about 4 pages on staff spinning though, and is primarily a club swinging resource. It is also out of print at last update, though a new edition is supposedly in the works. "For interest, I have also obtained a copy of "Indian Clubs" from "The All-England Series" published 1892. This contains great pictures of moustachioed gents doing their stuff and - most fascinatingly - contains a notation system for club swinging which results in some hilariously complex pages of ticks, arrows, fractions and brackets - must have been a nightmare for the poor soul who had to set it in hot metal." "Description: The Toss is studied as the preliminary of the Throw. It is rarely used as an exhibition trick except when alternating with HOH's or when continuously tossed from succeeding Wrist-Pivots. Its greater use is as a variant or monotony breaker in the point-of-repose VAMP. The Toss does not expect to gain altitude, it simply stands and spins, yet it has the throw appearance, a many spoked wheel with a definite hub (the Balance Point)." There are other much more modern books on baton twirling out there, such as "Baton Twirling : A Complete Illustrated Guide" available from Amazon.com. This was just the only one i had locally available for free at my library. There are a variety of books on martial arts available. Some relevant forms would be Bokido, Jokido, Aikido, Ekrima, Kali, Wing Chun, Kendo, Naginata and Arnis. However these will all be primarily sources of purely fighting moves, and will not contain many if any of these pure 'flourishes'. The actual names for the various length staffs are: bo or rokushakubo staff (6 foot), jo staff (4 foot), hanbo (3 foot), tanjo or eskrima staff (2 foot). See your local martial arts store or web-site for more details. "In the club swinging instructional video by Allan Jacobs, available from the IJA, Allan spends a lot of time teaching club swinging tricks by starting first with a long pole. It turns out that a lot of club swinging moves are actually long pole moves, with a gap in the middle of the pole. When the moves are done properly the clubs are always in opposition, as if they were the ends of a long pole." This film is no longer available as the original producer of the video won't allow any more to be duplicated for sale (unknown reasons). There is discussion that a new movie could be produced, featuring club swinging, staff spinning and meteor lessons, possibly also featuring some performances by a variety of performers. "Personally, I learned a great deal of the basics by watching a video of the Peking Opera. It was a special, originally telecast on HBO (I think) way back in 1984. (Acrobatics and object manipulation is to Peking Opera as singing is to western opera). One of the stories concerns the Monkey King, who has a magic staff. The actor playing Monkey King spins a 5 foot long staff baton-style, and his skill was incredible." I did a little investigation into this myself, and the opera titles that would be relevant are: "Monkey King Makes Havoc in Heaven", "Eighteen Arhats Fight with the Monkey King" and "Monkey King on the Journey to the West". If you find someone you can talk to about this, you are looking for operas from the Peking Opera style, and the Chao (or Chaozhou) Opera style. These are the more acrobatics and martial arts oriented styles. The best source for martial art videos dealing with staff work, is Kung-Fu Online. MAX ENTRE DEUX FEUX (1916) [Max Linder film] France. Slapstick comedy. Max Linder does short tricks with his top hat and then with his cane. W.C. Fields juggles briefly and does cane tricks. Over 2 minutes of good juggling scenes. W.C. Fields's "The Great McGonigle" juggling routine appears. This wonderful complete act is about 5 minutes long, includes 3 and four balls, cane, and cigar box tricks. Fields later juggles plates at a dinner. There is some umbrella manipulation similar to cane twirling. Also, Donald O'Connor does some hat manipulation while dancing. SEEN IT. very short hat and cane manipulation segment. Donald O'Conner does the famous "Make em laugh, Make em laugh" musical routine (lots of Keatonesque physical comedy). If you can stand a musical, watch it. SEEN IT. About an hour into it, Jackie does a 6 second or so staff spinning routine that is very nice (albeit the first one i've seen apart from myself in a mirror, so i have nothing to compare it to). I rewound and watched the clip about 20 times. The movie itself is one of the worst i've seen Jackie in. German made, Korean(?) language original, dubbed into english. SEEN IT. Contains some great 9-section whip chain swinging and some staff spinning sequences. Shows a head wrap with the whip chain. 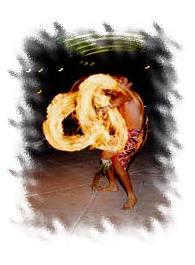 Tom James wrote: I happened to notice a very short clip (about 15 seconds) of a guy doing some fast Polynesian-style staff spinning during an episode of Star Trek Deep Space Nine. I don't know if it's really worth mentioning it, the episode itself was dire and even if it is available on video the humiliation of going into a store and actually buying it may well be too much for some people. But anyway. Here it is. "You are Cordially Invited" episode 7, season 6.